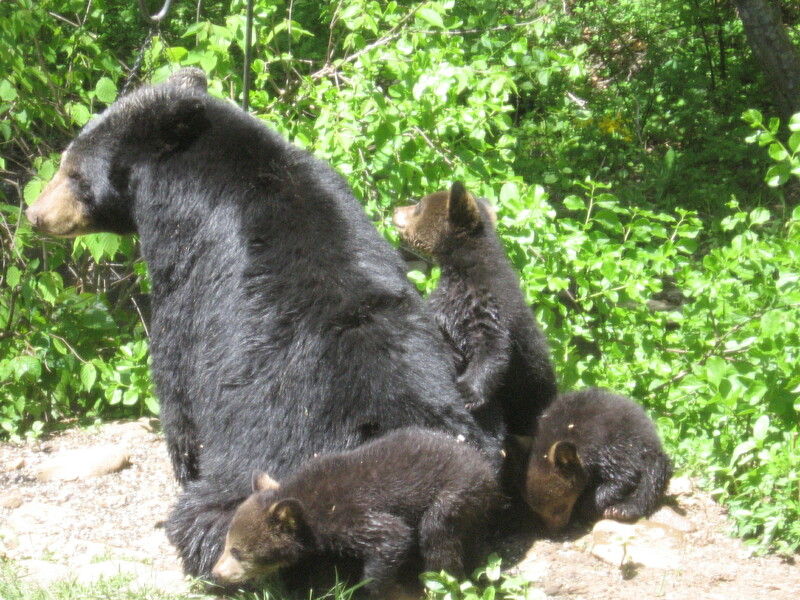 Mama and her cubs two years ago. The black bear is the state animal of West Virginia, therefore I’m a fan. And yet, in all my 18 years of living on the family farm, I never saw one. There was a big, rolly-polly bear at the Game Farm who loved to drink soda through the bars of his cage, but he was hardly a REAL bear. Then we moved to Western North Carolina which is apparently one of the top ten coolest places for bears to live. One day last summer we saw SEVEN different bears over the course of a single day. We’ve seen cubs playing in the trees, we’ve spent far too much money on birdseed (which we eventually learned NOT to do), we’ve named bears that came back season after season, we even had one bear who knew who to turn a doorknob (that back door STAYS locked). And the funny thing is, while I have an incredibly healthy respect for bears, I’m not afraid of them. This came home to me just yesterday. Earlier in the week Thistle and I were hiking and encountered two ladies who mentioned their dogs disturbed a yellow jacket’s nest along a trail we’d just hiked. I experienced a little jolt that I had so narrowly avoided danger (I had an allergic reaction once). Yesterday while hiking a different trail, Thistle and I walked up on a black bear indulging in a blackberry feast (I’d just been doing the same thing). Thistle froze and watched the animal–a mid-sized female I’m guessing–from about 30 feet away. I called her back to me (thank goodness she’s never chased a bear), snapped on her leash, and made enough noise for the bear to hear. The bear jumped like she’d been stung by a bee and hightailed it into the high brush to our left. We could hear a second bear crashing through the brush off to the right. We gave them a few moments to clear the area, then went on down the trail. I loudly talked to Thistle until we were well away lest we sneak up on any other snackers. And I wasn’t scared. I was cautious. I was alert and careful, but in my book yellow jackets are way scarier than bears. Who, by the way, eat stinging insect larvae. We have evidence *yuck* in the backyard that a bear is visiting us, but I have yet to see it. It wouldn’t surprise me because moose and especially like our backyard as well. Mowing the lawn is certainly challenging with all these animals “dropping” in. I know what you mean! Summer, with it’s abundance of fresh fruit, is especially interesting.